The number-one goal of any shootout should be to be 100-percent transparent with the reader. We want you to feel like you were the one riding the bikes. 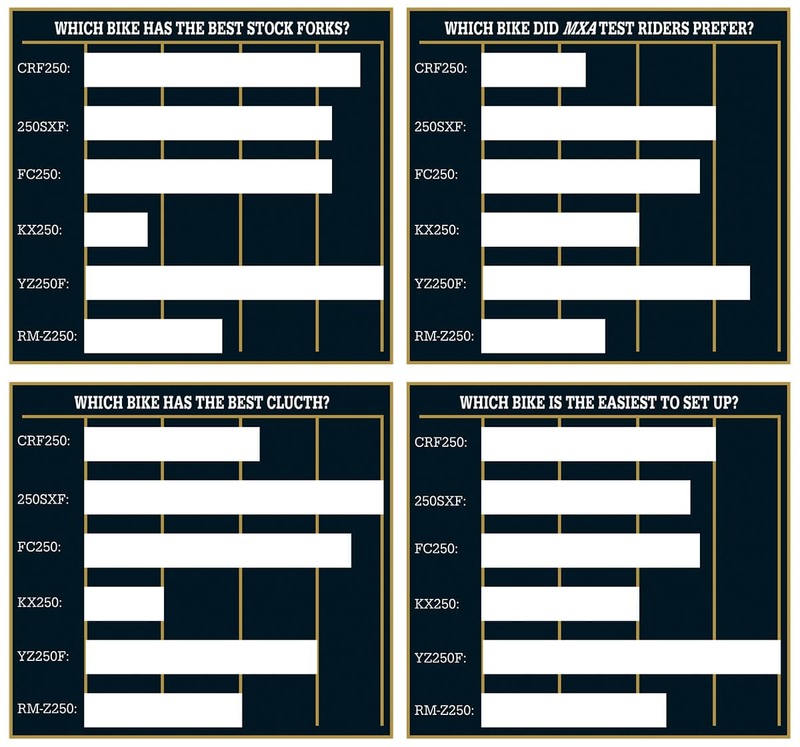 It is our job to lay out the shootout to allow you to figure out which is the best bike for you. To that end, we test each bike individually before putting them together. Of course, a shootout wouldn’t be a shootout without ranking the bikes from first to last. We understand that this ranking process can throw readers out of their wheelhouses. Faster riders have different requirements from slower riders. Riders with a good working relationship with their local dealer might want to stick with that brand. Have a garage full of Suzuki parts? Good reason to choose a Suzuki. Every bike in this shootout, regardless of where it ranks in the shootout hierarchy, is imperfect. All six bikes have strengths and weaknesses—and one bike’s weakness to some may be a strength to others. As strange as it may sound, not every MXA test rider chooses to race the bike that he picked as the best all-around 250 four-stroke for 2019. He may admire the shootout winner’s attributes, but feel more comfortable on a bike that does something else a little better. 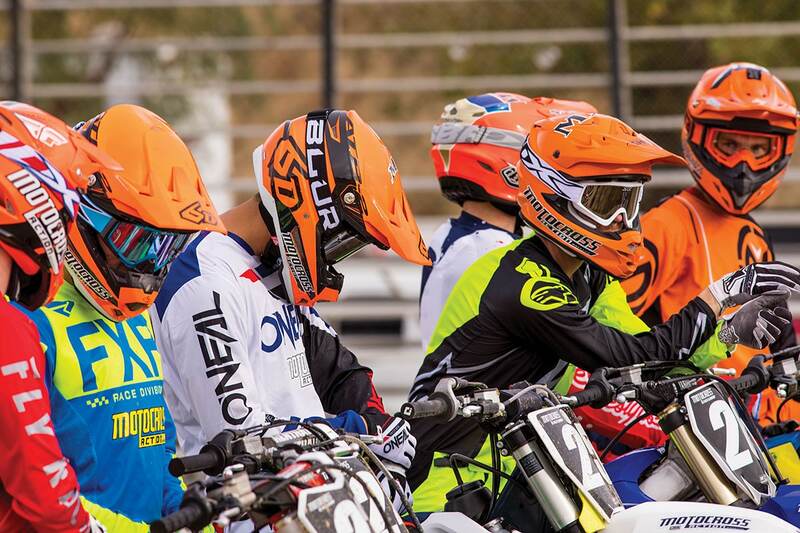 It can depend on how tall you are, how much you weigh, the terrain you ride on, your skill level, what kind of tracks you race on, your budget, factory contingency programs or your favorite color. Here is our raw and unfiltered view of the 2019 250 four-strokes. 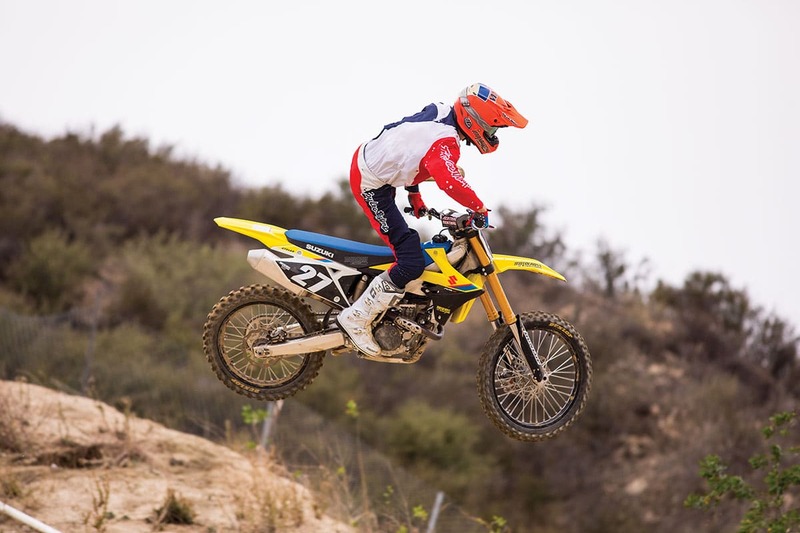 For 2019 Suzuki upped the ante on the RM-Z250. Its new cylinder head and new dual-fuel injector system bumped the power out of its previous trail-bike territory. The RM-Z250 is no longer at the bottom of the power totem pole. It is still low on the totem pole, but it offers great bottom-to-midrange grunt that is extremely easy to manage. This is the best beginner engine package on the market. The Suzuki was stuck in the rut of being an affordable, entry-level bike with a modest power output. Whether Suzuki liked that label or not, it was the only thing getting the brand attention from customers. For 2019, Suzuki tried to change its image with an RM-Z450-inspired frame and creative engine mods. Did Suzuki succeed? No. For some unknown reason, Suzuki valved its new Kayaba coil-spring forks to the point of being Supercross stiff. 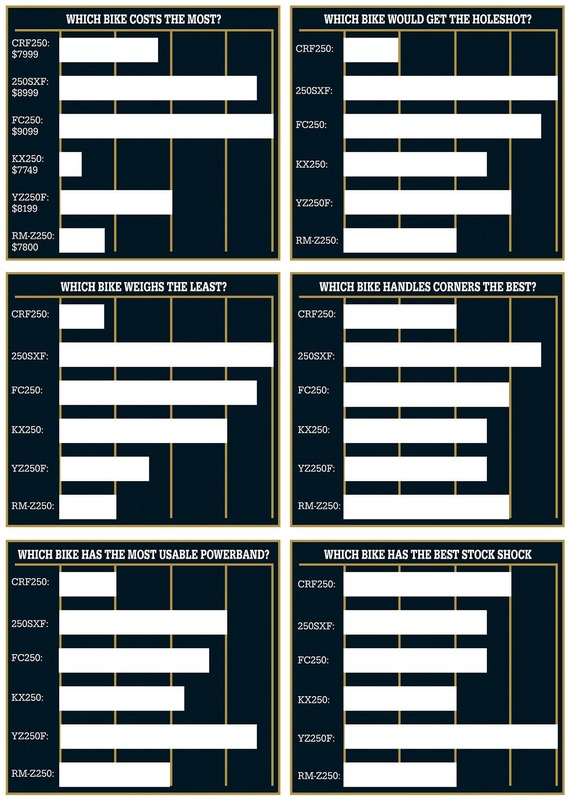 Did any MXA test riders like them? 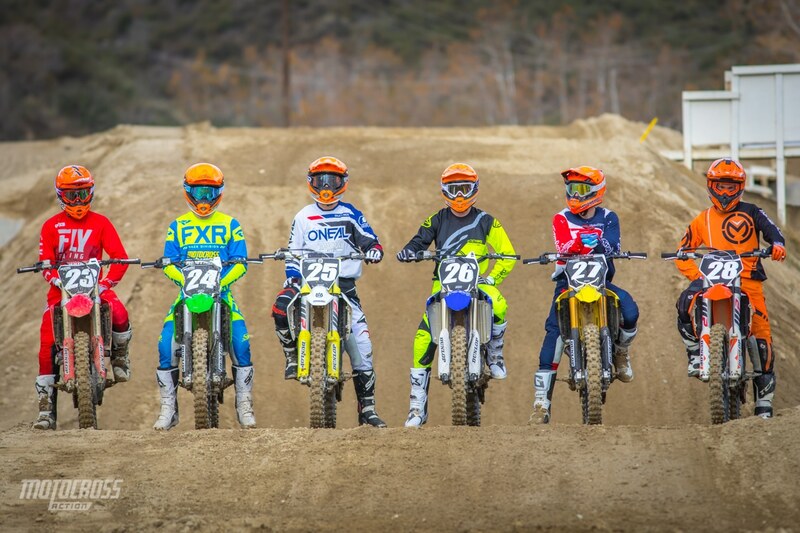 Yes, but they were our AMA Pro-caliber riders. The riders who were of the age and weight to race a 250 four-stroke thought we put cement in the forks. This is not the first time Suzuki has played this trick on us. 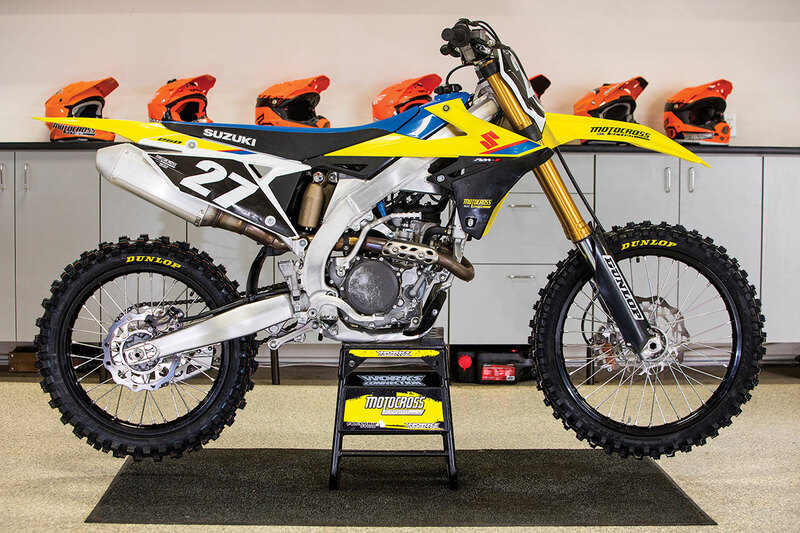 The 2014 and 2017 RM-Z450 forks were built stiff enough for Travis Pastrana to jump the Grand Canyon. Our suspicion? Suzuki of Japan must be hiring sumo wrestlers as their test riders. Overall, the 2019 RM-Z250 is a good bike, save for the super-stiff forks. You will need to get the valving lightened up by your favorite suspension tuner. 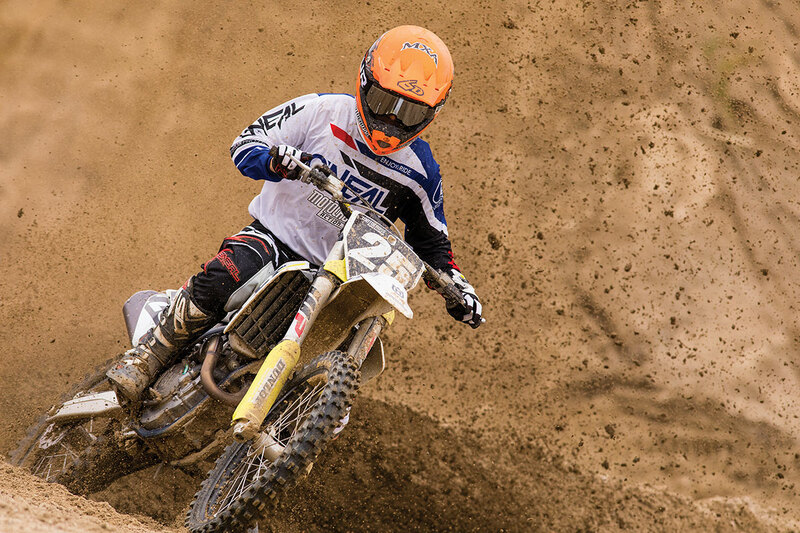 No biggie, as the RM-Z250 is one of the least-expensive bikes on the market at $7800. It turns great and offers a midrange engine that test riders liked. Where the Zook is behind the competition is in the e-start business. Suzuki knows that adding a battery, wiring harness, starter motor and starter gears would increase the overall weight to over 230 pounds. Adding an extra 5 pounds to this bike would be like dropping an anchor. The 2019 Suzuki RM-Z250 is a good bike with a workman-like chassis and utilitarian design, but it is not a great bike. Every test rider enjoyed riding the 2018—oops, we mean 2019—KX250. It offers a unique engine package, slim ergos, handling precision and the most control surface adjustment of any bike in the class. Since the KX250 is identical to last year’s model, save for a few green highlights, we got the same shootout results we got 12 months ago. On the plus side, the KX250 engine has the best bottom-end power in the class and hangs with the top dogs in the midrange; however, on top, the engine goes flat. It doesn’t fall off the map, but this is a very linear powerband that has very little personality. From the saddle, you wouldn’t know that it has the least peak horsepower in the class, thanks to a solid low-end grunt that thrusts it forward through the rpm range. It is a short-shift bike. 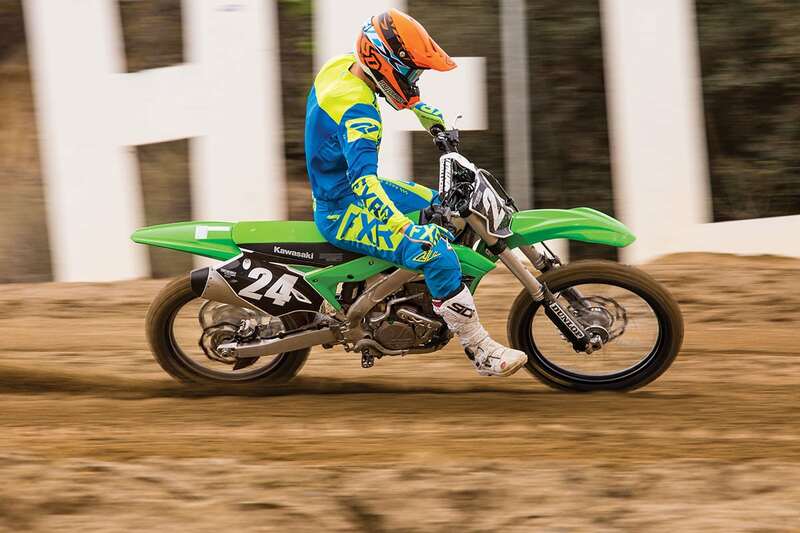 The KX250 came in fifth place in the 2019 MXA 250 shootout because there are as many negatives as there are positives. When Kawasaki bumped up the power of the 2017 KX250, it was too much for the clutch. We burned through clutch plates as though we were channeling Justin Barcia. Heavy-duty springs will help, but it really needs a bulletproof Rekluse or Hinson complete clutch to set it and forget it. 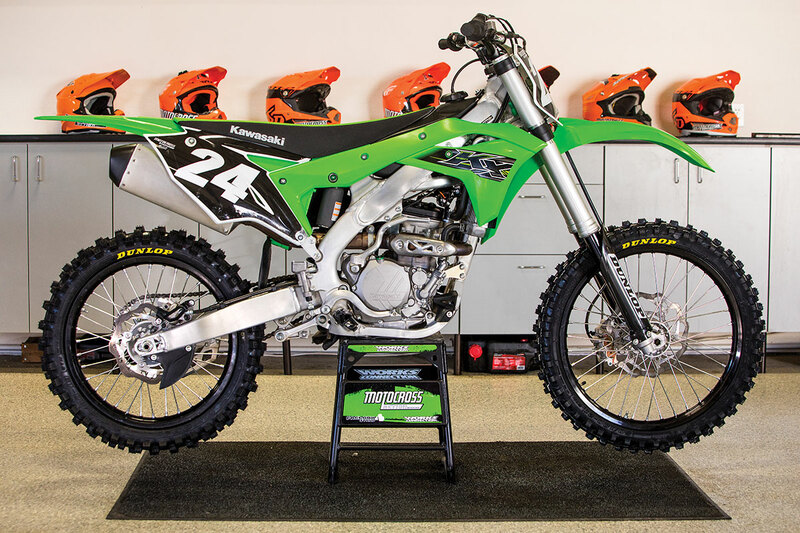 When this iteration of the KX250 came out in 2016, we were smitten with the Showa SFF 48mm forks. They did everything right. But, by 2018, they were doing everything wrong. The 2018–2019 valving has a horrible mid-stroke harsh spot with no way around it other than sending the forks to a suspension tuner for expensive fixes. We suggest Pro Circuit, as they know everything under the sun about the KX250. It goes without saying that we preferred the hard-hitting powerband of the 2016 KX250 over the later model’s smoothness. Last on the KX250’s list of faux pas is the lack of an electric starter. A few years ago, it was no big deal; but now customers demand it, and KTM, Husky, Yamaha and Honda offer it. The 2019 Kawasaki KX250 is the least-expensive 250 four-stroke at $7749. It is $1100 cheaper than the Husky FC250, which leaves some wiggle room to get the KX250 a better clutch and plusher forks. Sadly, you can’t buy personality. The CRF250’s saving grace for 2018 was its workmanlike chassis and suspension. Unfortunately, its go-for-broke top-end powerband was terrible. For 2019, Honda worked hard to find the missing low-to-mid power that the CRF250 desperately needed. Amazingly, Honda engineers succeeded in building an engine that was superior in every way to the 2018 mill. It gained 2 horsepower from 8000 to 10,000 rpm and 1 to 2 more ponies from 10,000 to 11,200 rpm, where it beats out the red, blue, orange, white and green machines. Its peak horsepower of 42.40 was up almost 2 ponies compared to last year. Guess what? The powerband was still terrible. How can a bike gain horsepower everywhere and still be bad? Although the CRF250 showed a significant gain in bottom to midrange power, it is still down up to 4 horses to the competition from 7000 to 10,000 rpm. The lack of low-to-mid transitional power made the CRF250 sluggish, especially on the exit of turns. It took its sweet time getting up to where the real horsepower lived. MXA test riders abused the clutch mercilessly, trying to urge the CRF250 to jump the gap from no low to optimum high. The last time every test rider universally disliked a powerband as much as the 2019 CRF250’s, it was on the 2018 Honda CRF250. This engine would be at its best on high-speed tracks where the engine could be kept percolating. Supercross tracks and outdoor tracks with lots of corners are the CRF250’s Kryptonite. As for the rest of the CRF250 package, there was little or nothing to complain about. The Showa suspension components were easy to set up and offered a plush feel front to rear. The forks are on the soft side and will bottom out with heavy or fast riders, but for most test riders the stock spring rate worked fine. 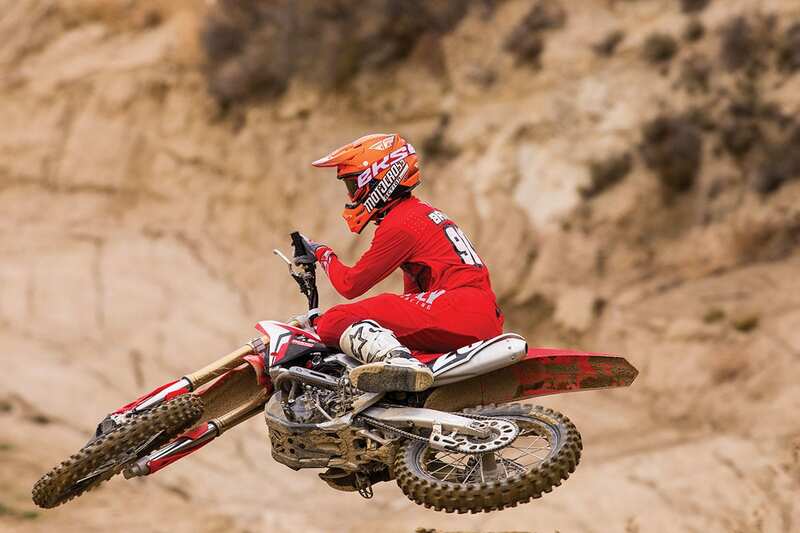 From the moment you swing a leg over the CRF250, you feel at home. Everything from the feel of the levers to the shape of the seat feels custom made. It has a nicely balanced chassis for the typical 250 four-stroke rider. If you are a Honda loyalist, the 2019 Honda CRF250 is hands down better than the 2018 model, thanks to its improved mid-and-up power. We hate to say it, but we will anyway. This bike could win the shootout with the Yamaha YZ250F engine in it. 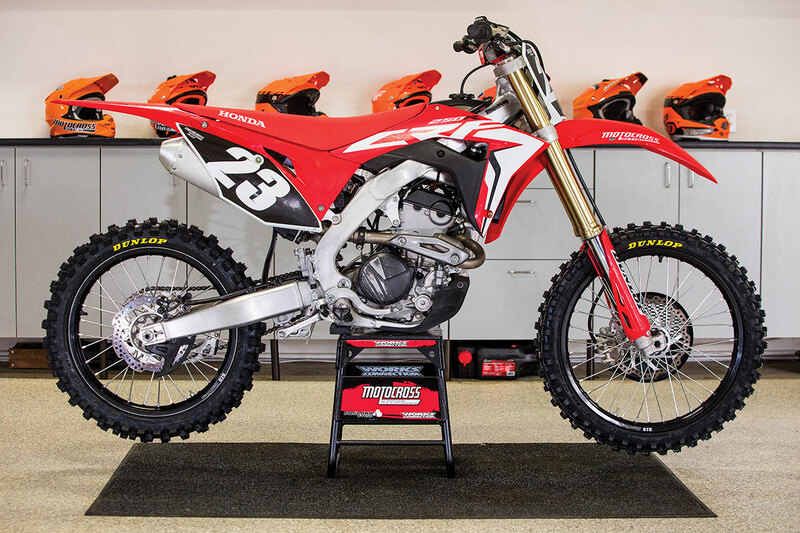 The CRF250 chassis and suspension are great, but the engine package spoils the cake. We wish that for just one year the pencil-pushers in Austria would allow the Husqvarna FC250 to be superior to its KTM 250SXF brother. The Austrian juggernaut teased us for 2019 by detuning the 250SXF and making the ergos and chassis of the FC250 more like a KTM’s. Although it was close, it was not enough. We also hoped, from day one, that Husqvarna would break away from the platform-sharing strategy that makes its bikes almost identical to KTM’s. But, that hasn’t been the case. It keeps getting harder to tell them apart. If we blindfolded our test riders and had them ride the 2019 FC250 and 250SXF back to back, only the wide rear end, handlebars and slower-revving engine would allow them to tell the two apart. We want Husqvarna to show some spark of initiative—a desire to be the best. It’s not possible for the clone to be the best. 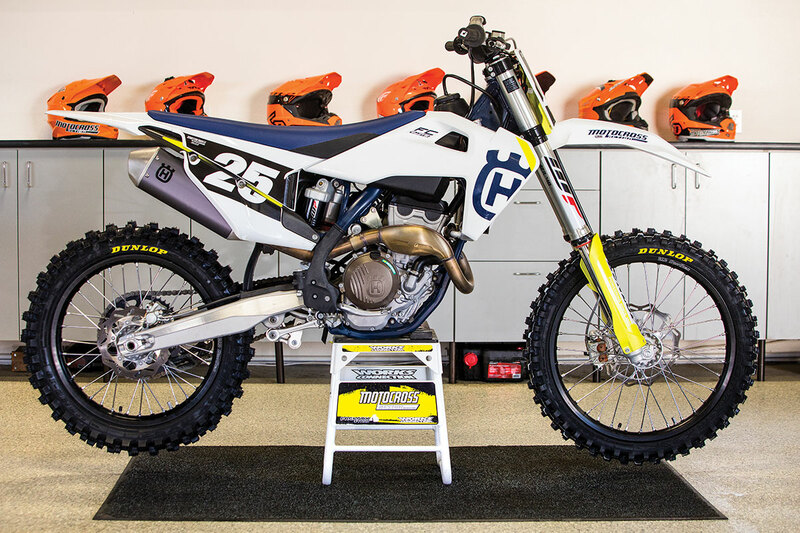 The 2019 Husqvarna FC250 is a fast bike. 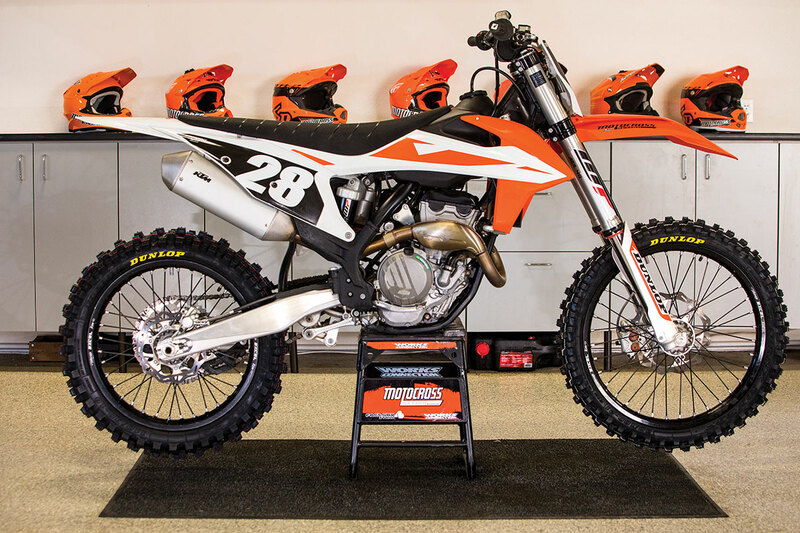 On the dyno, it is only 1/10th down on peak power to the high-rpm KTM 250SXF at 42.53 horsepower. It does make its power at a slower rev rate than the 250SXF, which makes the power curve more linear, and, for some riders, easier to ride. We quickly discovered that if the power felt too soft, we could turn it into an identical KTM 250SXF clone by drilling holes in the airbox cover and perforating the muffler’s backfire screen (it will eventually burn up). An interesting historical note is that our 2016 Husqvarna FC250 pumped out close to 44 ponies. So, why is it 42.53 now? Some of the changes that the Husqvarna engineers have made improved the midrange part of the powerband by giving up peak horsepower. That’s the simple explanation, but closer to the truth is that some of the updates on the 2019 FC250 cost it power for no good reason. The choked-up plastic airbox is a classic example of backwards engineering. Back in 2016, the Japanese “Big Four” were 4 horsepower behind KTM and Husky. Today, the Japanese brands are nipping at their heels. 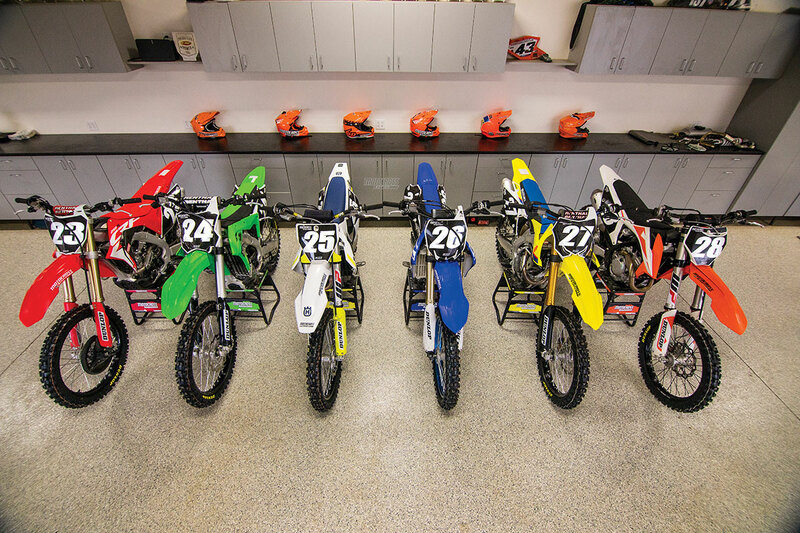 Husky and KTM can ill afford to go backwards again. We know that Husqvarna’s engineering staff can make the FC250 significantly better, but they continue to turn a blind eye to the closed-off airbox. On the opposite end of the spectrum, the Husky has many first-class features that Honda, Yamaha, Suzuki and Kawasaki are going to have to hustle to catch up on. Husky’s no-tools airbox, hydraulic DS clutch, electronics suite, 219-pound weight, awesome brakes, chromoly frame and finger-follower engine are unmatched. It is no secret that these top-notch features come with a price. At $9099, this is the most expensive bike in the class. The KTM 250SXF has been MXA’s reigning king of the 250 four-stroke class for the last two years. You might be surprised to learn that before KTM started winning shootouts in 2017 and 2018, KTM had spent the previous 15 years as an also-ran (often in last place from 2001 to 2015). Then, in 2016, the KTM 250SXF almost took the whole enchilada, but the atrocious WP 4CS forks ruined it by kicking them back to second place behind the 2016 YZ250F. 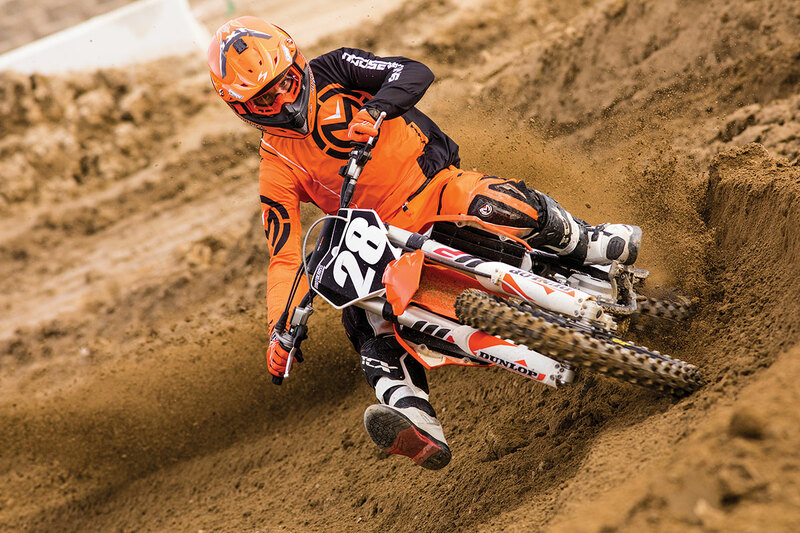 With the arrival of the WP AER air forks in 2017, the KTM 250SXF was finally able to dethrone all of the bullies that had kicked sand in its face since 2001. The 2017 and 2018 KTM 250SXFs had no peers. For 2019, the 250SXF went backward in our book. The power got mellower. The chassis got more rigid, and the suspension got harsher. While the 250SXF went backwards, Yamaha struck while the iron was hot. The all-new 2019 YZ250F package brought Yamaha back to the forefront. KTM still owns the power category by making the most peak horsepower and torque in the 2019 field. The KTM has great front-wheel traction and turns on a dime. It is the lightest bike in the class and offers the best brakes, clutch, hubs, shifting and airbox on the market. No doubt about it, the KTM 250SXF is the best bike money can buy for fast riders who are able to use all of its high-revving power. Most riders will never find the true potential of the KTM’s high-rpm adrenaline rush. The peak power is 42.65 horses at 13,800 rpm. You read that right; peak power is just 200 rpm shy of 14 grand. And, if you want max power, you have to bleed the engine dry; however, the peak power for 2019 is down more than a full horsepower from the 2018 KTM 250SXF. And guess what? The 2019 engine is identical to the 2018 engine. Where did the horse go? KTM decided to restrict the airbox like they did on the Husqvrana FC250. Why? Your guess is as good as ours. All we know is that our Makita drill is getting a workout. The 2019 KTM 250SXF’s stiff chassis is great for fast guys but unpleasant for the average Joe. KTM has catered to Intermediate and Pro riders for 2019 and not their prime clientele—weekend warriors. Along with its detuned power output, this is why the 2019 KTM 250SXF has been knocked off its throne by the Yamaha YZ250F for 2019. The 2019 Yamaha YZ250F is the heaviest 250 shootout winner in history. It tipped MXA’s calibrated balance-beam scale at 228 pounds. It gained 6 pounds due to adding the electric starter. The kicker is that the 2019 KTM 250SXF has an electric start as well but is 9 pounds lighter. The YZ250F is also the widest bike in the class. Even though Yamaha likes to claim that it is narrow, it is only narrow when compared to other Yamahas. It is obvious that the YZ250F has flaws that could be considered deal-breakers. Why aren’t they? Because everybody made mistakes in 2019. KTM stifled its power. Husqvarna didn’t step up. Honda has a one-dimensional powerband. Kawasaki has a lame-duck design with no personality, and Suzuki has a ways to go to get out of the hole it dug with years of neglect. Thus, the Yamaha is the “2019 MXA 250 Four-Stroke Shootout” winner—in spite of itself. This is the best overall bike for riders fast and slow. It offers a potent powerband that gets up and goes off the bottom, pulls hard in the middle, and keeps pulling on top. It is a complete engine package that is super easy to ride but can keep up with the 250SXF, FC250 and CRF250 on top. If you want to move the power around, the Yamaha Power tuner app allows you to seamlessly change maps that can be contoured to your liking—for free! All testers, from Beginner to Pro, had no complaints about the 2019 YZ250F powerplant. Don’t get us wrong, it’s not the fastest engine; it’s the most usable. What clinches the deal for the 2019 YZ250F is the Kayaba SSS suspension. Bottom line: SSS forks are incredible. They are plush at the initial part of the stroke, well damped in the middle and have excellent bottoming resistance. And they do all of this while feeling supple throughout their whole stroke. Even better, you can be fast, slow, skinny or fat, and within a few clicks you can find a good ballpark setting. The shock is the best in the business and matches the forks perfectly. This is the best-balanced machine of 2019. 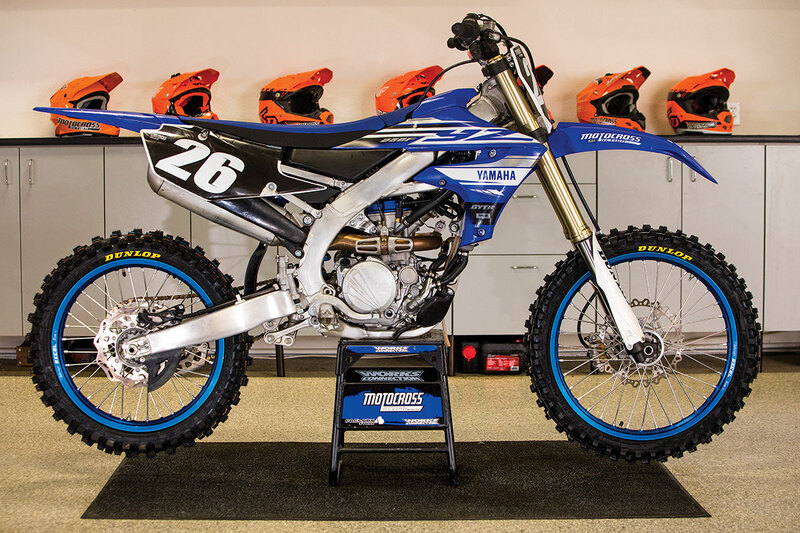 We wouldn’t consider the YZ250F to be the best turning bike in the class; it can feel a bit heavy at turn-in. 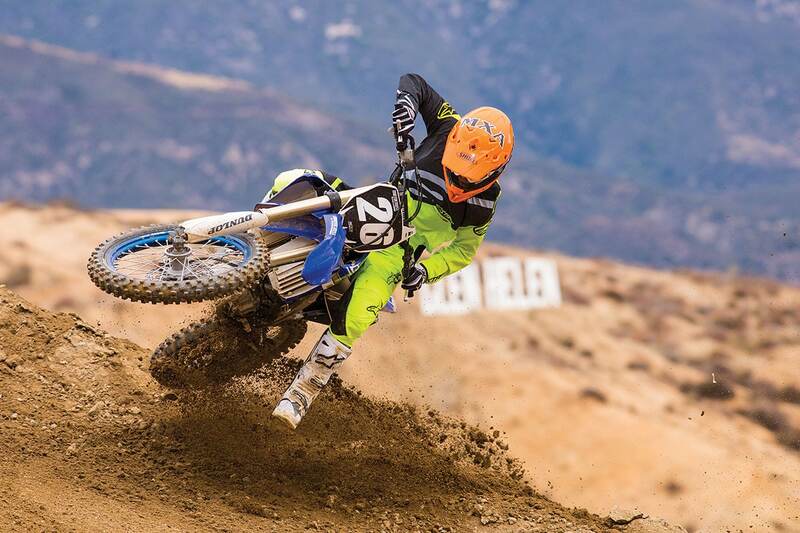 But, it doesn’t require any extra effort to coax a smooth corner from the YZ250F. The CRF250 and RM-Z250 can turn sharper, but you have to be on your A-game to make it happen without any mistakes. The 2019 YZ250F has its imperfections, as does every bike in this shootout. Thankfully, its biggest charm is that it is tailored for the masses rather than the few. The YZ250F offers a durable package that can stand the test of time, accompanied by a potent engine and superb suspension.